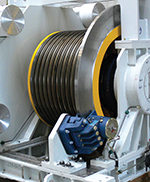 Twiflex introduced the MXSE (spring applied - electromagnetically released) range of brakes to act on a flange integral to the traction sheave in lifts and elevators. In certain circumstances, particularly with freight elevators, it is desirable to hold the car in position by clamping the rails. Excessive rope stretch and the resulting tripping risk (any loading problems associated with the creation of a step between car and landing) are eliminated by positioning the brakes on opposing corners of the car to prevent it from twisting in the shaft. Single or multiple units may be used, according to local lift directives, and the braking force may be adjusted to meet the exact torque requirements of the machine. Brake arrangements using pneumatic, hydraulic or mechanical means of actuation are available, and subsequent development work will soon result in the launch of springapplied - electromagnetically released actuators to suit other brake calipers in the Twfilex range. Twiflex Ltd. helped a major escalator manufacturer by supplying MXSH brakes for installation to ensure accuracy and dependability. The pivoted arm design of the Twiflex brake inherently accommodates any typical axial float that may be found in the disc/coupling assembly. Self-adjusting actuators ensure the correct pad to disc air gap is always maintained. Ultimate safety is provided by the auxiliary brake acting on a disc directly connected to the headshaft, such that in a chain failure condition the machine may be brought safely to a stop. Status monitoring prevents the escalator from being started if adjustment is required or a fault is sensed. In addition to the brake units, all ancillary items; switches, pedestals, hydraulics, manuals and (if-necessary) on-site training can be provided. If the braking requirement cannot be met with a standard product, a solution may be specifically engineered to suit, as in this instance. A major elevator OEMspecifies Twiflex VKSD disc brakesfor use on high-performance elevator drives installed in skyscrapers.The dual function brakesstop the elevator cars precisely at the correct floor level and also decelerate the carsin an emergency (such as a malfunction). 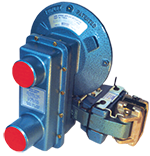 Two calipermodules are used on each elevator drive to provide the required redundant safety. Unlike electromagnetically actuated brakesfound in conventional elevators, the VKSD brakes are hydraulically actuated since each caliper’s clamping force exceeds 100 kN.A dedicated dual-circuit hydraulic unit (also supplied by Twiflex) generatesthe necessary oil pressure for both brake calipers. The brake systemis designed to dissipate the large amount of kinetic energy(whichmay exceed 2 kWh) generated bythis high rise elevator application. Brake disc temperature can rise bymore than 100K during an emergency stop. The Twiflex VKSD disc brake caliper range is available in a standard configuration comprising two springmodules acting on each side of the disc or, asshown above, as a 'floating' brake. The minimum disc thickness is 20mm, minimum disc diameter is 1000mm. 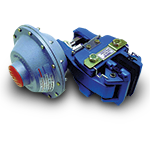 Rated braking force extends from 28 kN to 119 kN, with a nominal coefficient of friction mu = 0.4.